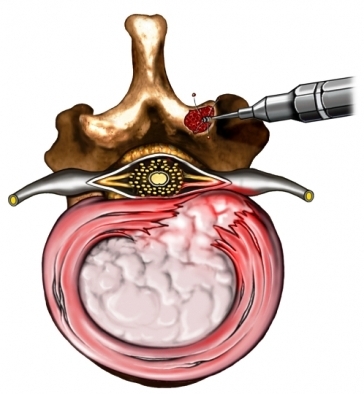 A laminectomy is a surgery to remove a small portion of a vertebra called the lamina. Vertebrae are the bones of the spine. The lamina is a small tall like portion on the rear of the vertebra. In some cases, only a portion of the lamina is removed from the vertebra. This procedure is known as laminotomy. A laminectomy is usually done to help take pressure off your spinal cord or a nerve running out from your spinal cord. It is also done to gain access to the spinal cord, bones, and discs that are below the lamina. Herniated discs , bony spurs, or other problems can cause narrowing of the canals that the nerves and spinal cord run through. This can irritate the nerve if it gets too narrow. Often, a laminectomy is done along with a disc removal to help make the canal larger and take pressure off the nerve being irritated. Physical therapy and medication will be tried first. The surgery is done when other treatments have not worked. It is most often done to treat symptoms that keep getting worse. If you are overweight, talk to your doctor about how to successfully lose weight . This will decrease the amount of stress on your back. Talk to you doctor about your medications. You may need to stop certain medications up to a week before your procedure. Eat a light meal the night before. Avoid eating or drinking anything after midnight. If the surgery is done with minimally invasive techniques, you will only need a few small incisions. A scope and small instruments will be inserted into these incisions. In some cases, open surgery will be done. This involves making a larger cut in the skin over the area in the back. Once the area is visible, part or all of the lamina will be removed using a drill or other tools. The affected nerves may be moved into a better location to reduce further irritation. The spinal cord and discs between the vertebra will be inspected. If needed, the disc will also be removed to reduce pressure on the spinal cord or nerves. Other issues like bone spurs will be addressed as well. When the work is complete, the incision will be closed with stitches or staples. Anesthesia will prevent pain during the procedure. You will have pain during recovery. Pain medication will help manage pain. The length of stay will depend on the amount of work that was done. You may be able to go home the same day or you may need to stay in the hospital for a couple of days. The type and extent of surgery will determine how long you will be in recovery. Activities that place stress on the back such as bending or lifting will be restricted for a few months. Your return to work will depend on the physical requirements of your job. Staying active with appropriate activity like walking is important to speed recovery. Physical therapy will be recommended to help regain strength and flexibility. Medications will help manage pain and swelling pain. Allen RT, Garfin SR. 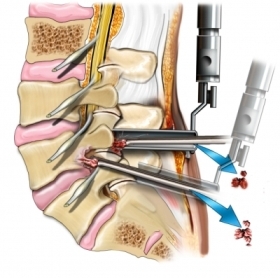 The economics of minimally invasive spine surgery: The value perspective. Spine. 2010;35(26 Suppl):S375-S382. Djurasovic M, Glassman SD, et al. Contemporary management of symptomatic lumbar spinal stenosis. Orthop Clin North Am. 2010;41(2):183-191. Herniated disc. American Association of Neurological Surgeons website. Available at: http://www.aans.org/Patient%20Information/Conditions%20and%20Treatments/Herniated%20Disc.aspx. Accessed November 13, 2017. Laminectomy. Encyclopedia of Surgery website. Available at: http://www.surgeryencyclopedia.com/Fi-La/Laminectomy.html. Accessed November 13, 2017. Lindström D, Azodi O, et al. Effects of a perioperative smoking cessation intervention on postoperative complications: A randomized trial. Ann Surg. 2008;248(5):739-745. Pain. National Institute of Neurological Disorders and Stroke website. Available at: https://www.ninds.nih.gov/Disorders/All-Disorders/Chronic-Pain-Information-Page. Accessed November 13, 2017.